Come visit our beautiful, newly renovated store! Since 1995, the Mike Risko Music School has brought music education into the community. We are now proud to bring you the Mike Risko Music Store where you can purchase quality equipment, instruments and sheet music. Because we are not only musicians, but educators, we are able to educate our consumers on what to buy and what instruments will best suit their needs. We are happy to help you find exactly what you need and look forward to meeting you. In addition to being able to purchase equipment, instruments and sheet music, we also bring an incredible band instrument rental program to the community. Our band instrument rental program provides you with quality new and like new instruments. We carry all strings, brass and woodwinds and have a large stock to choose from. We also provide instrument repairs on all band and orchestra instruments in addition to repairing guitars, bass guitars and amps. We also do string changes and set ups on guitars and bass guitars. 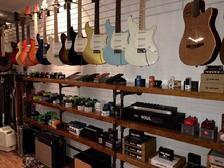 The Mike Risko Music Store is open at 144-146 Croton Avenue. You can reach us at the music store at 914-762-8757. We look forward to working with you.